Now a day , a new type of of virus is continuously spreading which disables the task manager in the windows. Recently my one of the friend suffered from this virus and when he Googled he did not find any authentic solution. 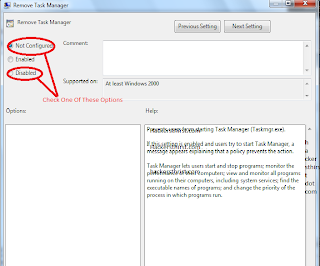 So this made me to write this tutorial to show you that how can you enable the disabled task manager. Which is majorly effected by Virus. Here nothing is needed to be downloaded , the main feature lies in your own computer . Just follow these easy steps. Type gpedit.msc in the run. Double click option number 3. Check Not Configured or Disabled . You are done. You may now see your Task Manager. Simaltaneously there are two types of viruses. 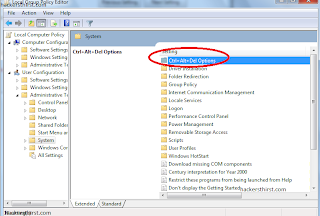 One deletes the Task Manager while one changes this key to Enabled. So the type in which the Task Manager is deleted can't be overcome . It is necessary to have an anti-virus like AVAST. The one which deletes Task Manager can only be overcome through these steps. Use Avast anti-virus to scan all the drives and it may take much time.